Through their portrayal in the media, in movies, cartoons, comics and science-fiction stories, pterosaurs have been consistently described and depicted inaccurately. Here we address some of the more common inaccuracies seen in the media and the popular literature. Misconceptions about pterosaurs are not limited to popular culture however: many text books, reference works and scientific books (generally written by people who weren’t experts on pterosaurs) have made erroneous claims about pterosaurs, in particular about their wing anatomy, feeding habits and body mass. The term ‘pterodactyl’ is sometimes used for pterosaurs, particularly by journalists, with the implication being that the term is synonymous with pterosaur. In fact it isn’t: the term pterodactyl—originally written ‘ptero-dactyle’—was first used for one specific type of Upper Jurassic pterosaur, the European ctenochasmatoid Pterodactylus, and doesn’t apply to other members of Pterosauria. It has been used on occasion for giant short-tailed pterosaurs like pteranodontids, but this is not common among pterosaur workers. If we used vernacular names for prehistoric animals (which, generally speaking, we don’t), then we might well term members of the genus Pterodactylus ‘pterodactyls’. But we don’t, so the words pterodactyl and ptero-dactyle are pretty much redundant today. Cartoonists, artists and film-makers have often portrayed pterosaurs as having bat-like wings, and writers have often described pterosaur wings as ‘leathery’, or at times as flimsy and as thin as tissue paper. Pterosaur wings were unique in that a single, super-enlarged, particularly robust finger (the fourth finger) provided the only bony support for the wing membrane, but subparallel fibres termed aktinofibrils were embedded within the membrane and would have provided additional structural support. This system is very different from that of bats, where the second, third, fourth and fifth fingers are all involved in supporting the wing membranes. 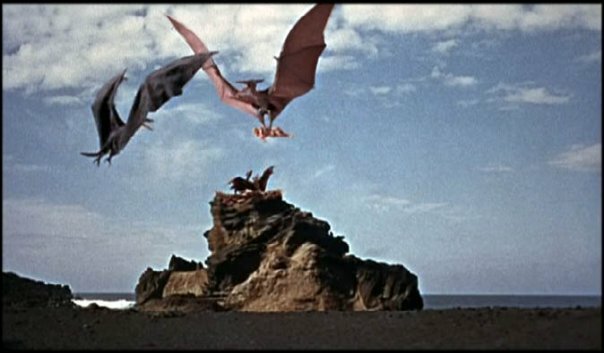 Any depiction which shows bat-like fingers supporting a pterosaur’s wing membrane is just flat wrong (movie-makers like Ray Harryhausen did this simply because they thought it looked cool, and because it made the stop-motion model’s wings easier to operate). Exceptionally preserved pterosaur fossils show us that, like bats, pterosaurs had blood vessels and very thin muscle layers within their wing membranes. However, pterosaurs were unique in that they also had a special air-filled layer embedded within the wing membrane, and their blood vessel system was not simple, but large and complicated. While pterosaur wing membranes would have been thin (with a thickness of only a few millimetres), they were not just a single sheet of skin as used to be imagined, but relatively robust and complicated structures that were probably resistant to tearing and damage. A pterosaur that broke the bones of its wing would probably have been doomed, but damage to the wing membranes might not necessarily have been so bad: bats sometimes damage their wing membranes by snagging them on plants and debris, but holes and tears are not fatal and soon heal up. It is also completely inaccurate to imagine pterosaur wings as leathery, given that leather is a very heavy, relatively incompliant material. Pterosaurs are sometimes described in the media as ‘flying dinosaurs’. In fact pterosaurs are not part of the group formally termed Dinosauria, although the presence of various morphological characters which are shared by both groups suggest that they are close relatives. The shared presence of a relatively long neck with proportionally long cervical vertebrae, of an elongate tibia, and of a hinge-like ankle joint and elongate metatarsals in the foot indicate that pterosaurs, dinosaurs and a few other groups should be united in a clade which has been termed Ornithodira. It is inferred from this distribution of features that pterosaurs and dinosaurs shared an ancestor that was alive during the middle Triassic. However, it has been argued on several occasions that pterosaurs are not close to dinosaurs, but instead are part of an altogether different reptile group called the Protorosauria (the only well known member of this group is the bizarre long-necked marine form Tanystropheus). Whether pterosaurs are closer to dinosaurs or protorosaurs remains the source of argument, but at the moment the evidence for an affinity with dinosaurs seems better supported. It’s perhaps worth noting that one palaeontologist (Robert Bakker) argued on one occasion (in his 1986 book Dinosaur Heresies) that pterosaurs are, in fact, part of Dinosauria. However, this is because he used a more inclusive version of Dinosauria than that currently favoured by other palaeontologists: his concept of Dinosauria was essentially synonymous with Ornithodira. Some pterosaurs have been portrayed in the popular literature, and in films and cartoons, as being the wrong size. Mostly this is because certain pterosaurs—namely Pterodactylus and Rhamphorhynchus from Upper Jurassic Europe—have served as templates for imaginary generic pterosaurs. In the movies The Land That Time Forgot (1975) and The People That Time Forgot (1977), for example, the pterosaurs are Pteranodon-sized (with wingspans of 5 metres or more), but they are clearly based on Pterodactylus, a form in which the wingspan was usually less than 1 m. Comic stories have also depicted Rhamphorhynchus and Dimorphodon as similarly gigantic, whereas in fact both had wingspans of less than 1.5 m.
To date, the largest known pterosaurs are members of the Cretaceous azhdarchid group like Quetzalcoatlus and Hatzegopteryx: these animals had wingspans of 10-12 m. However, in 2005 came the exciting news that evidence for an even larger pterosaur had been discovered: supposedly, a wing fragment from the Jordan and a trackway from Mexico indicated the presence of a new type of gigantic azhdarchid with an 18 m wingspan. This news, announced at a scientific conference by a colleague who shall remain nameless, was picked up by journalists and reported in newspapers and on radios all around the world. Unfortunately, the evidence for this super-pterosaur turned out to be erroneous. The bone turned out to be a piece of fossil wood and the trackway had not been produced by a giant pterosaur, but by a predatory dinosaur. Oh well. One of the most familiar pterosaurs, the large, crested oceanic ornithocheiroid Pteranodon, is well known for being toothless. It was far from the only toothless pterosaur—tapejarids, tupuxuarids and azhdarchids were toothless too. However, cartoons and movies have often equipped Pteranodon with teeth, both in an effort to make it look more scary, and (presumably) to make it look more alien and prehistoric than it was. Neither pteranodontids nor their relatives the nyctosaurids had teeth, but the great irony is that we now know of two Cretaceous pterosaurs—Ludodactylus from the Brazilian Crato Formation and Caulkicephalus from the Isle of Wight’s Wessex Formation—that did combine a Pteranodon-like head crest with teeth. Less well known is that azhdarchids—the group of Cretaceous pterosaurs that includes Quetzalcoatlus—have also been depicted with teeth on occasion. Today we know that azhdarchids had very elongate, toothless skulls superficially similar to those of storks or herons, but some early reconstructions from the 1970s and 80s showed Quetzalcoatlus with a particularly bizarre, proportionally small head. A large bony lump was depicted on the back of its head and it was shown with small pointed teeth! Films and cartoons consistently portray pterosaurs as being equipped with prehensile, strongly muscled feet with a big opposable digit: in other words, they are depicted as superficially recalling human hands. Of course, the pterosaurs in the films and cartoons need such feet in order to pick up the humans that they’re menacing—a tradition that is familiar thanks to One Million Years B.C. and was even included in Jurassic Park III. No pterosaur, so far as we know, had prehensile feet with opposable digits: in fact pterosaur feet are generally weakly muscled, and certainly lack opposable digits. Pteranodon—the animal which is generally shown in the movies picking people up—was like other members of its group (Ornithocheiroidea) in having proportionally small, slender-boned feet. Unusual winged animals reported from around the world have been suggested by some cryptozoologists and creationists to be modern-day pterosaurs that survived the end-Cretaceous extinction event. 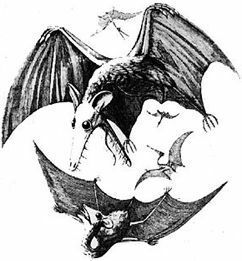 From Africa, people have reported a semi-aquatic winged animal called the kongamato while on New Guinea and the surrounding islands sightings are claimed of a gigantic, bioluminescent, crested flying creature (the duah) and a smaller, long-tailed version, the ropen. Fossil evidence demonstrates overwhelmingly that pterosaurs did not survive beyond the end of the Cretaceous, and the sightings of pterosaur-like animals that have been reported appear to be a combination of hoaxes and misidentification of large birds and bats. So-called modern pterosaurs are generally ugly, dark, carnivorous, bat-winged horrors—they sound more like imaginary generic flying monsters than the pterosaurs we know from the fossil record.